Welcome to my motorcycle restoration, rebuild and custom projects page. Back 2015, Motorbooks published my first major work, my classic Japanese restoration book, but not content with that I started on Book 2 which features building customs, so its time to focus soley on custom work. Design and build my z650 Cafe Racer. The z650 Cafe Racer is 100% fabrication. When I first bought it as a neglected barn find out west, It featured in my book as a sample of how bad you can neglect and butcher a z650. Well its been stripped, and numerous parts are now coming together. You can read more on it here -> 1977 z650 B1 CR build. If your chasing information on my book then visit the page dedicated to it. 1974 Kawaskai z1a Restoration project. 1976 Kawasaki z900-A4 Restoration Project – (Mostly Completed). 1977 Kawasaki z650-B1 – Completed but still some tidy up work. 1982 GPz1100-B2 – Currently in final re-assembly phase. 1977 z650 Custom rebuild project – Registered and 99% completed. 1977 z650 Cafe Racer – Being used as feature in my next book! Currently sourcing and fabricating custom parts. I have been slowly rebuilding two bikes a 1974 Kawasaki z1A and a 1978 Kawasaki z1000-A2. Both live in the lounge room partially due to the garage being full and because the house is significantly cleaner. They also make a good conversation starter when friends come to visit. I used my 1974 z1A and 1978 z1000A2 extensively for photo shoots for my book so the rolling frame was stripped and rebuilt numerous times to get different angles and effects for my first book. I have ordered numerous small parts recently including a new wiring harness, bolts and a Stainless Steel spoke kit, checkout my article on lacing up the rear wheel. I’ve also finally sourced a pair of rear caliper pistons and rebuild kit so that will see the rear brakes assembled. The z1A is basically a finished rolling frame so I’m currently working on the engine. The rebuilds have not been a high priority but I intend to have two rolling frames completed and at least the engine for the z1000A2 installed before the end of 2019. New coils with leads and caps -shiping now (Feb 2018). Aftermarket brake lines (2 front and 1 rear). Electronic ignition – Dyna ? Possibly exhaust flanges (they have disappeared). A few odds and ends for the frame. GPz900R Starter Clutch Replacement Tutorial. Kawasaki z1000G and H EFI/DFI systems. Rear Wheel Lacing – z1000A1 / z1000A2. Like all hobbies, I have lots more projects to complete, otherwise I might decide to sell some in the near future. 1980 Kawasaki z650-F1 – In storage – custom build. 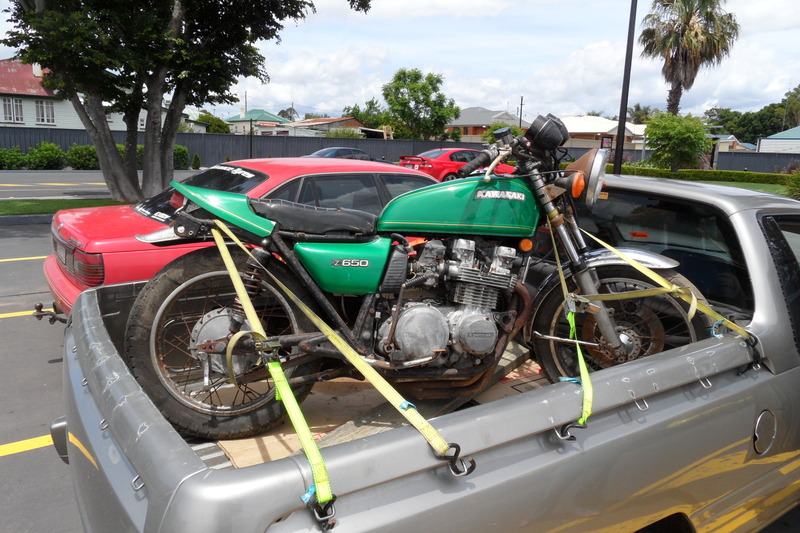 1972 Honda CB750K2 – In storage – factory restoration. 1974 Honda CB750K4 Cafe Racer – Rolling frame in storage engine in garage (#5 engine in list of work to do). 1983 ZX1100-A1 – in storage – Custom machine with ELR paint and modern fittings. 1985 GPz900 Cafe Racer – still planning how this would work but very “doable”. From time to time I visit these sites, worth a look on your part. There are quite a number of parts suppliers, many are ripoff merchants and I wont pay double for a part that I know will come back on the market in due course. The following 3 I have purchased from and been very reasonable with good quality service. There might be other and in due course I will discover them and use them so this list is not definitive. If you have been searching for my old z900.piczo.com web site, they went bust and all the content on it is now gone. Hi Sid, looking forward to future commentary and project updates … excellent work so far ….